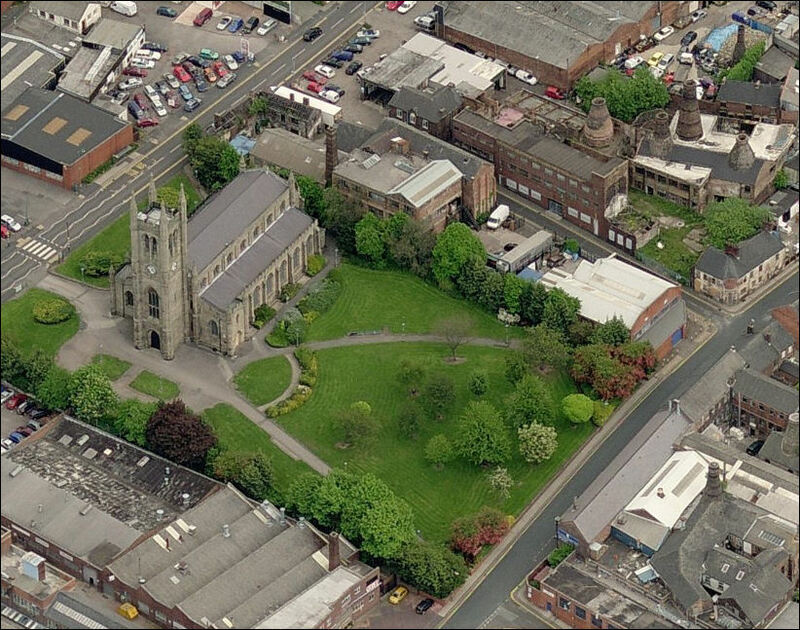 The Church of St. James sits between the High Street (now Uttoxeter Road) and Normacot Road - the area surrounding the church had the highest density of potworks than any area in the city of Stoke-on-Trent. When Middleton took over the works completely he renamed it Delphine Pottery. 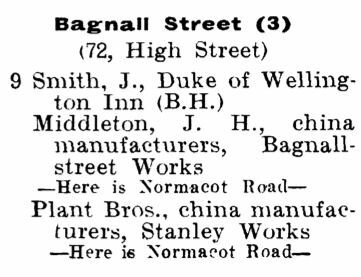 By 1947 the trade directory records Hudson & Middleton, Ltd., Delphine Pottery (in Bagnall Street). 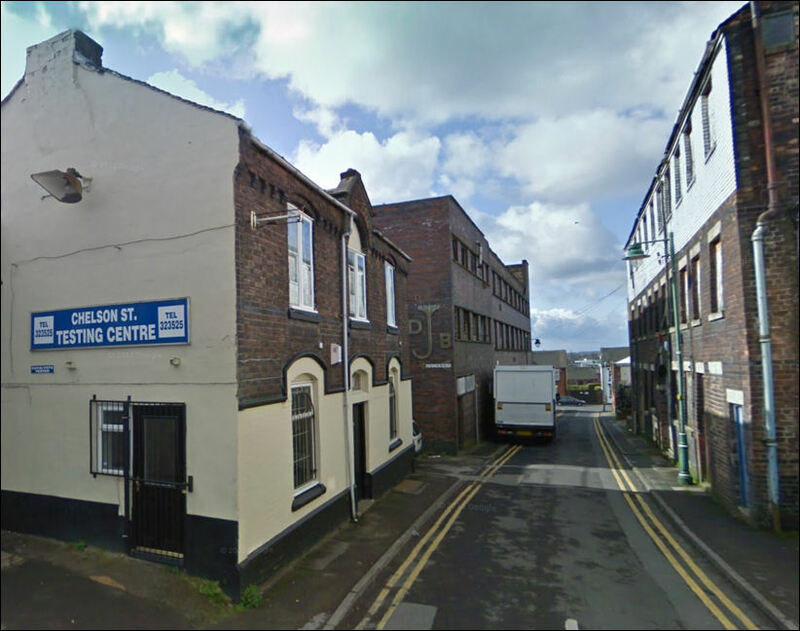 The Middleton and Hudson families operated the Alma Works in Longton together from 1870 to 1889 at which time they started their separate pottery companies, in 1941 their descendants joined forces again at the Sutherland Pottery. An article by Graham Birks the great great grandson of William Hudson snr. 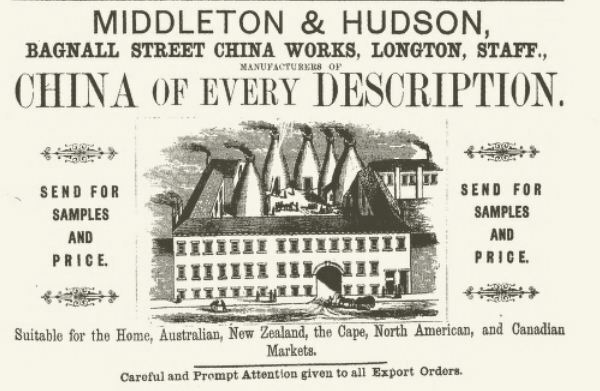 "The name of the Hudson family has been synonymous with the Longton pottery manufacturing industry for nearly 150 years, but exactly how and when did it all begin. Without doubt the main influence in the family was William, but exactly which William are we talking about, there were actually three generations of William and they were all in the pottery business. William snr. (1st) was born in 1818 and married Sarah Robinson in 1842. Both William and Sarah lived in Stone Road and Sarah's father was a potter at the time of their marriage. A few years later we find in the local pottery trade directories the names of Robinson & Hudson operating at the Foley pottery works in Fenton. Could this indeed be the start of things to come? William and Sarah went on to have eight children in all, the eldest being of course William jnr (2nd). William jnr was born in 1842 and it was with him that the long standing alliance with Joseph Henry Middleton more than likely took place. So what else do we know about this pottery family? William snr had three other sons and four daughters. Of the girls, Harriet died when only two years old in 1853. Ann married David Chapman in 1867 while Sarah Jane married Alfred Morris in 1879. The youngest, again named Harriet E. married Ernest Bilton (another well known pottery name)in 1885. As for the sons, Charles died early aged only 4 years. John and Thomas however followed their father and elder brother William into the pottery business, but here again tragedy struck the family. Thomas died of a stroke in 1886 when only 31 years old. He and his wife Mary Teresa had four children, only one of whom managed to survive to any great age. Thomas lost his two eldest daughters within days of each other just before Christmas in 1884. His only son, John William, survived his father for only another ten years, passing away age sixteen in 1896. His youngest daughter Edith Mary however married in 1910 and lived locally in the Normacot area not far from the Sutherland works. She eventually passed away in 1949 leaving behind two married daughters and a grandson. So where does the third generation of William appear ? Well, surprise surprise William jnr's only son was chistened William Arthur in 1875. He too was a china manufacturer and married Lilian Ridgway in 1898. When he died in 1928 he was buried with his parents in the graveyard at Normacot church. 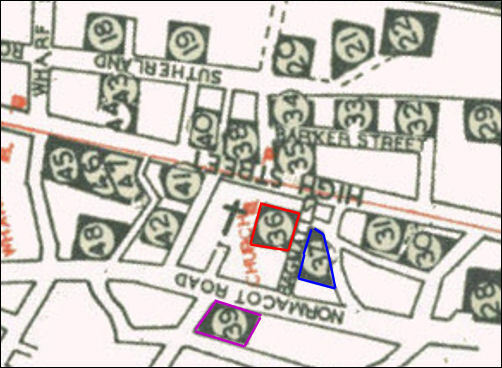 His parents at the times of their death were both living at Sutherland House, Blythe Bridge, a property which still stands today. William snr and his wife Sarah eventually moved to Cromwell House, Rough Close where they were listed as being farmers of ten acres. William passed away following what was described in the Staffordshire Advertiser at that time as " a painful illness" in 1879 with his widow Sarah following him a few years later in 1884. Cromwell House which stands at the top of Windmill Hill today was later owned by the Barlow family and in the early 1900's this area was always known locally as "Barlows Bank". It may or may not be a coincidence but one of William Hudson jnrs two daughters, Mary Jane married local estate agent George Barlow in 1896!. A further study of the local trade directories for the area around these times provides even more interesting facts with all the following operating in the local Longton area. 1864 - 1867 Robinson, Hudson & Co.
A short time later the Hudson & Middleton families once more got together and formed what was to be their most successful partnership to date operating from the Sutherland works in Normacot Road. Manufacturing under the names of Hudson & Middleton and Sutherland china the firm went on for many highly successful years, right up to the present day in fact, albeit now operating under a very different management."